My last column, reported on the huge growth of Australians using roll-your-own tobacco in the past few years. Because of a tobacco tax anomaly, which will end in September this year, many smokers have migrated to roll-your-own as a less expensive alternative to factory made cigarettes. The shift to roll-your-own tobacco is certainly one factor that has slowed the decline in smoking in Australia in the past three years. There is unanimous agreement in public health that price and high public acceptance of the harms of smoking are the two single most important factors that reduce tobacco use. This is why all industries, including Big Tobacco, engage in price discounting and lobbying to keep sales taxes low. 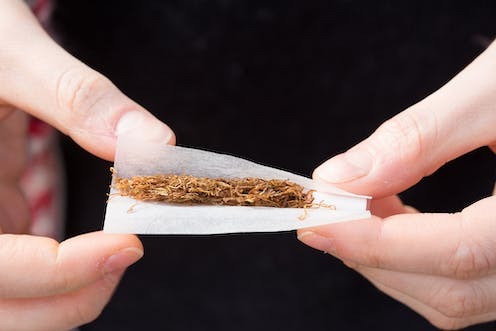 While the relative cheapness of roll-your-own tobacco is a major explanation of its rising popularity, several other factors are also relevant. Many people who use it like the ritual of rolling their cigarettes, feeling it is a creative and relaxing ritual. There’s something nice and relaxing about rolling your own as opposed to just pulling one out of the packet, … the sort’ve process of it is quite enjoyable … and also the whole sort’ve ritual just around smoking in general, like sit down and have a coffee, have a cigarette sorta thing … so it’s ritualistic in that sense. I just imagine that um, tailor made has more chemicals in it. But I don’t know if that’s true but it kind’ve tastes that way … I dunno, it’s hard to explain it’s just not as, like, clean … tasting. Why use additives at all? retain optimum moisture in the tobacco (using compounds known as humectants) to stop tobacco drying out when stored or exposed to air. This last category of additives, humectants, are particularly important with roll-your-own tobacco. That’s because it’s exposed to air every time a smoker opens the tobacco pouch or does not seal it properly, making it more likely to dry out. 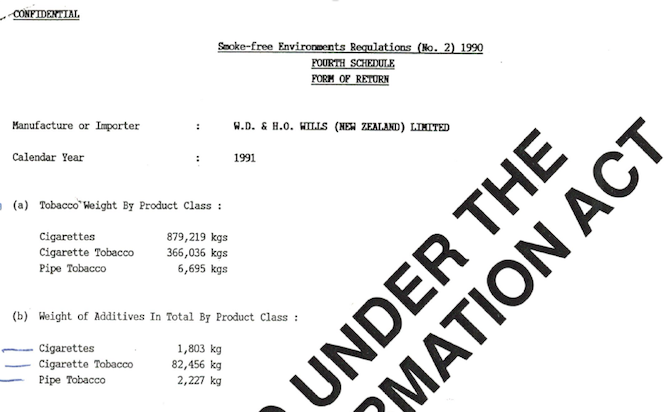 In 1990, the New Zealand government became the first to require the tobacco industry submit data on the volume of additives used in tobacco products. Most tobacco products sold in New Zealand at that time were imported from Australia. The extract below from tobacco company WD & HO Wills’ first report to the NZ government in 1991 makes interesting reading. The report, obtained under Freedom of Information, shows factory made cigarettes had just 0.2% of additives (by weight) out of total tobacco; roll-your-own cigarette tobacco had 22.5%; and pipe tobacco had a third by total weight in additives. So much for the enduring myth that roll-your-own tobacco has less additives than cigarettes. Nearly a quarter of every lungful of smoke inhaled from a roll-your-own cigarette contains particles and gases from the thermal partial decomposition of chemical additives in the tobacco mix. Why don’t we know more about these additives? Unlike every other product (food, drinks, medicines) intended to be taken into the body, cigarettes are immune from government quality and safety standards. Manufacturers can use any legal, natural or artificial ingredient they wish from a long list of approved additives. These additives have been approved for use in foods, but the Australian government has not signed off on their safety when each smoker burns and inhales them many thousands of times a year. Each year the three main tobacco companies operating in Australia voluntarily disclose the additives used in each brand of cigarettes. However, they do not disclose which “processing aids” they use in each brand, nor do they describe what “processing aids” are. Processing aids and preservatives that are not significantly present in, and do not functionally affect, the finished product are grouped as “processing aids” and/or “preservatives” [my emphasis]. What “functionally affect” means here is also anyone’s guess. Significantly, manufacturers do not disclose the same information for roll-your-own tobacco. In 1981, the National Health and Medical Research Council’s Pesticides and Agricultural Chemicals Committee tabled information stating that average levels of the now banned organochlorine DDT in Australian samples of cigarettes were 43 times higher than found in US and UK cigarettes. When I questioned in 1986 why this monitoring had been stopped, I was advised government policy was that all cigarette smoking was very dangerous, regardless of the levels of additives and pesticide residue they contained. 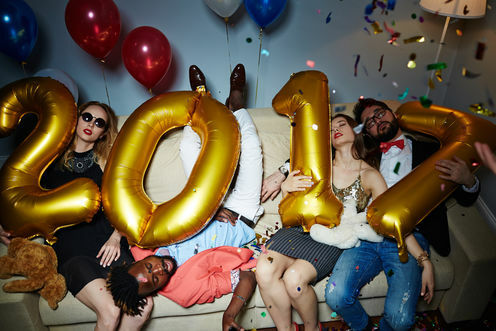 Our view is that smoking in like being in health hell and the extra impact of additives is like turning the temperature up just another degree. In this paper I published in 2003, internal industry documents made available after litigation in the USA, showed that tobacco used in Australian cigarettes contained alarming levels of pesticide residue, including organochlorines like DDT and dieldrin. Extremely high pesticide residue levels have been found in all samples submitted by PM-Australia, eg. DDT group, 300 ppm; HCH-group up to 100 ppm; dieldrin, up to 22 ppm. PM-Australia refers to Philip Morris Australia, the HCH-group to hexachlorocyclohexane additives and ppm to parts per million. These levels are astronomical compared with the 7.5 ppm maximum standard for DDT that had been recommended in a 1976 report of the Commission of the European Communities and adopted by the German government. We have no more recent public data on pesticide residue in cigarettes sold in Australia. But all cigarette and hand-rolling tobacco sold in Australia is grown overseas, often in less developed nations where agricultural practices can be poorly regulated. It is possible, even likely, pesticide contamination continues today. So as actor Yul Brynner famously advised as he was dying from lung cancer at just 65 years “whatever you do .. don’t smoke”. And don’t kid yourself that it’s only the additives that are the problem. Actor Yul Brynner’s advice as he was dying from lung cancer: “Whatever you do … don’t smoke”.